This article is about the Star that grants users invincibility. For other uses of "Star", see Star. For the power-up in Super Mario Galaxy and Super Mario Galaxy 2, see Rainbow Star. "Starman" redirects here. For information about the enemy from the MOTHER / EarthBound series that appears in Super Smash Bros. for Nintendo 3DS / Wii U and Super Smash Bros. Ultimate, see Assist Trophy § Starman and List of Smash Run enemies § Starman. A bright yellow star with eyes. 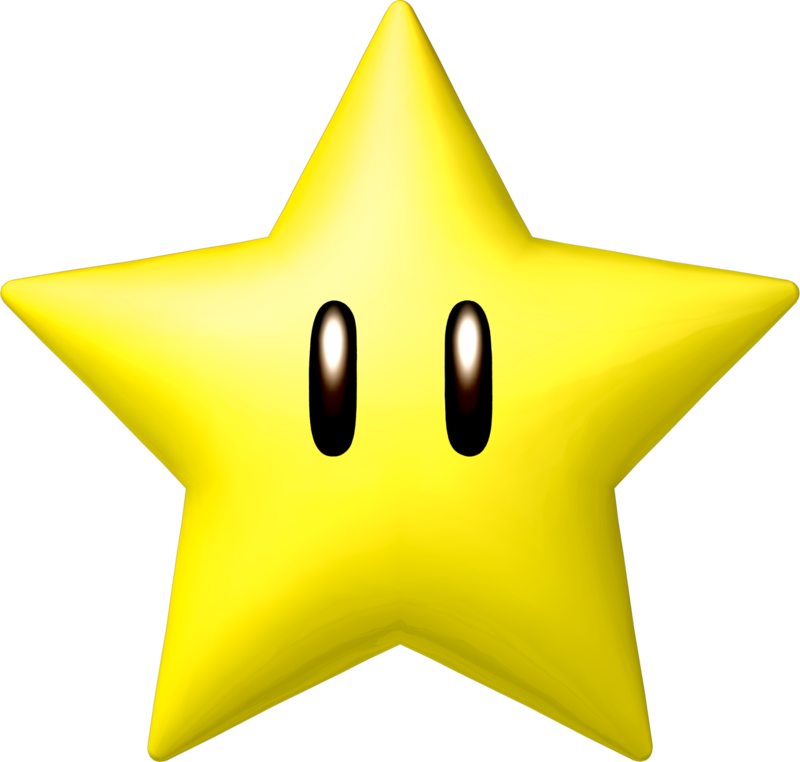 Super Stars (also referred to as Starmen, Invincible Stars or simply Stars) are items used in many Mario games, including the Super Mario series and the Mario Kart series. If the player gets a Star, they will become invincible. The user becomes temporarily invulnerable to all damage, being able to defeat anything and carrying up points, except to hazards that would normally be fatal regardless of power-ups (lava, pits, time-over, getting crushed, etc). Most projectiles or enemies that come into contact with the user of the Star while it is activated are destroyed, damaged, or knocked off screen (depending on the type of enemy and what game it is). The Star also increases the speed of the user substantially. Starting with Super Mario World, if the player collides with and defeats eight enemies while invincible (five in Super Mario Land 2 and Super Mario 3D Land), they will get an extra life. The point chain from the New Super Mario Bros. games is 200 - 400 - 800 - 1000 - 2000 - 4000 - 8000 - 1UP - 1UP - 1UP... As they continue defeating enemies, they will keep getting extra lives for each additional enemy defeated until the Star's power wears off and they are no longer invulnerable, with the exception of Super Mario 3D World, where after getting an 1-Up the chain of points restarts again (... 4000 - 8000 - 1UP - 200 - 400...). Touching another Star while already invincible will prolong the effect and allow the player to continue getting more lives. A Starman in Super Mario Bros..
Starmen made their debut in the game Super Mario Bros.. It is a very rare item, only found in some levels. When Mario or Luigi get it, they will turn invincible, allowing them to destroy enemies and go through hazards without getting hurt (though they will still lose a life if they fall in a pit or run out of time). However, the star's power is only temporary and it will disappear after a certain amount of time. This is the first Mario power-up to have eyes. The Super Star returns in the same manner as everything else that returns in Super Mario Bros.: The Lost Levels. They still grant Mario invincibility and the ability to defeat any enemy he touches. Starmen return in Super Mario Bros. 2, but the only way to get one is to collect five cherries in a level. The stars have the exact same effect as in the previous games; it will grant the player invincibility and the ability to defeat any enemy. Instead of bouncing, it will float upwards from the bottom of the screen in a zig-zag fashion. Starmen are more common in Super Mario Bros. 3. Just like the preceding games, they grant Mario invincibility, but in addition, Mario can run slightly faster than normal. However, unlike most other games, the star's power lasts shorter than normal. If Mario jumps, he'll do flips in the air. This game also introduces "Star Chains", where certain ? blocks that normally contain coins will contain additional stars instead if Mario is invincible when hitting them. If Mario is fast/efficient enough, he can complete large sections of a level while invincible. This is achievable on Worlds 3-2, 5-1, 5-7, 7-3, and 7-7, and bar Magic Wing use, it is the only way to complete the last of these levels. Starmens also appear as icons in the goal roulette, which must be hit in order to clear a level. If the player gets three Stars (easily done by running at max speed and jumping to the goal at a 45° angle), they receive five extra lives. Stars make a return in the game, Super Mario Land. Little has changed between the preceding game and this game regarding gameplay effects. The music, however, is different than the ordinary music. The music is actually two loops of an excerpt of the famous Infernal Galop, a tune most commonly associated with the can-can. Super Stars are very rare in Super Mario World, just like the preceding games. Stars are mostly found in Roulette Blocks. If the player manages to get a star while the items are getting changed, they will be able to defeat any enemy and become invincible to any attacks for a limited amount of time, as in past games. The main difference, however, is that the player gains a combo, similar to a shell or a jump combo, when they defeat enemies. This results in increasing point values for each enemy, eventually scoring extra lives for each enemy starting on the eighth enemy, which became a recurring trait of the power-up, including in remakes of previous games where this trait was not present. In Super Mario Land 2: 6 Golden Coins, Stars can be found. They make Mario turn invincible and move faster, much like the other games before, except the stars do not bounce. The music was changed once again: this time, it is a unique song. Starmen make the player turn invincible in New Super Mario Bros., as always. They are much rarer in this game and sometimes appear in hidden ? blocks. None of them can be found in Toad Houses, and there is no way to put one in the Item Storage. Mario and Luigi can run a lot faster when they are invincible, as the star's power doesn't last as long (only about 10 seconds). The star is the second rarest item (after the Blue Shell power-up) and can only be found in some levels, such as 1-1, 1-2, 4-6, 4-Castle, 6-2, 7-3, 8-4, and 8-7. There is a new ability for the Starmen: a trail of Blue Coins will appear behind the player, though it only works in certain levels. A different type of star also appears exclusively in the multiplayer mode, a Big Star. Mario or Luigi has to collect most of them to win. Although Super Stars do not appear in Super Mario Galaxy and Super Mario Galaxy 2, Rainbow Stars share the same function and also play the invincibility theme while under the effect of one. In New Super Mario Bros. Wii, Super Stars are mostly found through Roulette Blocks or just regular Question Blocks. They behave very similarly to the previous game, but with a different theme cover version and they now have the ability to light up dark places entirely. The player can now obtain them from Toad Houses and store them in the inventory. If an invincible player grabs another player, they too will gain the power of invincibility. Super Stars make their 3D Mario debut in Super Mario 3D Land, and have the same abilities as in previous games. They are exceptionally more common in this game. Unlike in most other games, in order to start getting extra lives for hitting enemies, the player only needs to hit five enemies, instead of the standard eight. Super Stars reappear in New Super Mario Bros. 2, functioning and behaving as in the previous 2D Mario games. Also, the player is able to store a Star in the Item Storage, but it is only possible in the World Star Toad House (by obtaining all the Star Coins and the Moon Coins). Super Stars return in New Super Mario Bros. U and function the same way they did in New Super Mario Bros. Wii. A Super Star from Super Mario 3D World. Super Stars reappear in Super Mario 3D World, this time working like they do in most other games, though the sharing feature from New Super Mario Bros. Wii is retained: when one player acquires a Super Star, they can touch other players and make them invincible as well. Unlike in most other games, though, they only award an extra life for every eighth enemy defeated on contact. They do not appear as frequently as they do in Super Mario 3D Land. In Super Mario Maker, Super Mario Maker for Nintendo 3DS and Super Mario Maker 2, Super Stars are one of the various course elements players are allowed to place in their levels. They act as they do in other Super Mario titles, providing the player with invincibility that defeats enemies on contact for a limited period of time. Super Stars reappear in Super Mario Run. This time around, the user of the item becomes slightly magnetic as well as invincible, as coins will be drawn towards them. Black Coins, however, are resistant to this force and will simply shake left to right. In Toad Rally, collecting a Super Star will also start Coin Rush mode, with the meter glowing white until the effects wear off. 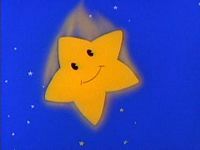 A Star from The Super Mario Bros. Super Show! Starmen also make several appearances throughout the three Mario animated cartoon series produced by DIC Entertainment. In The Super Mario Bros. Super Show!, they do not grant invincibility; they instead can power-up Mario and Luigi into Fire Mario and Fire Luigi, giving them increased strength and the ability to shoot fireballs. The person wielding the Starman, often Mario, usually recites, "Starman, star bright, give me pasta power, give me pasta might! ", before powering up. This power lasts until either a fair bit of time elapsed, or they are attacked by an enemy. However, Fire Flowers, along with other powerful artifacts such as Magic Pendants, can also be used in lieu of Starmen in order to power-up. In "Toad Warriors", Toad manages to transform into the Toad Warrior by using a Starman, although in the next episode, "The Fire of Hercufleas", he transforms into Super Toad by using a Fire Flower. Starmen continue to make appearances into The Adventures of Super Mario Bros. 3 and Super Mario World. In these appearances, they no longer follow the rules of The Super Mario Bros. Super Show! Instead, they grant temporary invincibility, just like in the games. Stars also appear in the first installment of the Wario Land series, Wario Land: Super Mario Land 3. Here, Wario is able to use the Star for the first time. Besides the theme that plays while invincible, the Star's effects haven't changed much from the previous games. The Star also makes Wario run even faster. Super Stars appear in Yoshi's Safari, dropped from Flying ? Blocks. When dropped from a yellow Flying ? Block, a Super Star's invincibility for Yoshi immediately takes effect, allowing him to defeat any enemies he touches for a limited time. The player also earns 2,000 bonus points. Super Stars can also be dropped from dark green Flying ? Blocks and are used for boss battles only, functioning the same way they do outside the battle. When not used at all, 5,000 bonus points are added to the player's score. Super Stars appear as rare power-ups in Super Mario World 2: Yoshi's Island and Yoshi's Island: Super Mario Advance 3. In this appearance, it turns Yoshi into a giant Yoshi's Egg, and Baby Mario into Superstar Mario, a form which highly resembles Cape Mario from Super Mario World. The Super Star reappears in Yoshi's Island DS, having the same effects as in the previous game. They only appear in the levels Baby Mario and Baby Peach: Dynamic Duo, Castle of Big Guy the Stilted, Superhard Acrobatics and Yoshi's Island Easter Eggs. A similar item, the Yoshi Star, appears in two colors in Yoshi's New Island; they both turn Yoshi into Super Yoshi. The yellow ones make him invincible and let him run on walls and ceilings, while the red ones let him blast through enemies and walls for a brief time. Both forms can be prolonged by grabbing more Yoshi Stars of the same color. In Mario's Time Machine, several Super Stars appear as statues in Bowser's Museum. Mario can use them as platforms to reach some doors. 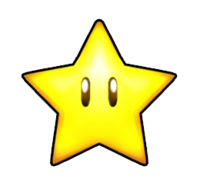 Stars appear in all Mario Kart games, serving as a rare item that only low-ranking drivers can get. 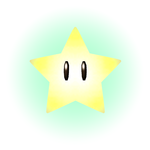 Stars make the player who uses it invincible to all attacks and able to knock over items, course obstacles and other drivers, making them lose their current items (prior to Mario Kart 7). The player receives a speed boost increasing their average speed by 1/3 and is able to cross off-road terrain without losing any speed (Super Mario Kart and Mario Kart: Super Circuit are exceptions), However, the Star only lasts for seven and a half seconds before wearing off. In some places, Stars can be obtained through special blocks. One is in DK Pass, where there is a super item block on top of a hill. If the player, in any position, touches the item block, the player may receive a Star, Triple Mushrooms, a single Mushroom, or a single Red Shell. The same rule applies for Chain Chomp Wheel, except that Red Shells and Triple Mushrooms are absent. 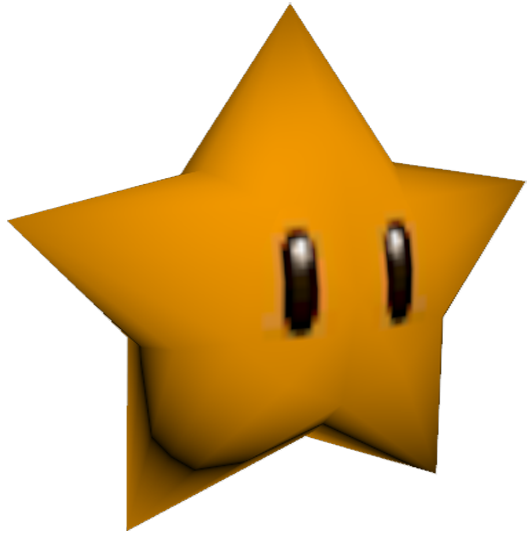 The Star is also the emblem of the Star Cup in every Mario Kart game to date. In Mario Kart Wii, the Sugarscoot has a star emblem on its spare tire on the rear. In this game, when characters acquire this item, their voice will echo, with the exception of Rosalina, whose voice will echo even more, as her voice already echoes. One of the leaf piles on the Wiggler portion of the track Maple Treeway also has the potential to drop Stars when driven through. In Mario Kart 7, all courses that have obstacles that drop items when broken (like the jars on Shy Guy Bazaar) have the potential to drop a Star when they do so. Also, starting in this game, the player can steal Balloons and Coins in Battle Mode when hitting people with the star. In Mario Kart Arcade GP, Mario Kart Arcade GP 2, and Mario Kart Arcade GP DX, the Super Star appears again. In Mario Kart 8 and Mario Kart 8 Deluxe, the Princess Peach statue in Toad Harbor can be seen holding a Star in her raised right hand. Super Stars first appear as an item in Super Mario RPG: Legend of the Seven Stars, where Mario can occasionally find the rare item and use it to defeat enemies on the overworld without engaging a battle. Doing this will still earn Mario Experience Points. A Super Star in Super Smash Bros. Brawl. A Super Star in Super Smash Bros. for Wii U. Stars appear in every game of the Super Smash Bros. series. If players touch a Star, they will become invincible, allowing them to attack foes, without worrying about damage. However, unlike with the actual Mario games, players will not be able to hurt their opponents just by touching them. In the first two Super Smash Bros. games, the Super Star has a completely unique arrangement of its theme played, though from Super Smash Bros. Brawl onwards, the item uses its theme from Super Mario Bros. instead. 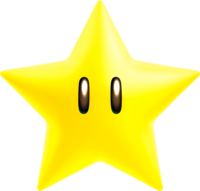 A Star also appears as a sticker in Super Smash Bros. Brawl, as well as a support spirit in Super Smash Bros. Ultimate granting the fighter temporary invincibility if they land the first attack in battle. Stars appear in the Bowser Stage from Mario Tennis. Stars also appear in Item Battle from Mario Power Tennis, and appear as the emblem of the Star Cup and on its trophy. In Mario Tennis Open, a Star is the emblem for the Final Cup, and appears on its trophy. A tennis racket, uniform, wrist bands, and shoes are designed based on this item and are available for Mii customization. Super Stars are briefly mentioned in Mario & Luigi: Superstar Saga and Mario & Luigi: Superstar Saga + Bowser's Minions, where they are said to be an ingredient of Invincishrooms. Additionally, in the Game Boy Advance version of Mario Bros. included with the game, Super Stars can be found in the Mario Bros. Battle multi-player mode. Specifically, they can hatch from Eggs, which are one of the items the player can obtain after busting out of a garbage can. They do not appear in the Mario Bros. Classic single-player mode or any other version of the game. While actual Super Stars do not appear in Mario & Luigi: Bowser's Inside Story and Mario & Luigi: Bowser's Inside Story + Bowser Jr.'s Journey, the Super Star appears as the icon of the Star Rank. Also, one of the attacks of Bowser Memory M involves a (pixelated) Super Star. Super Stars appear in Mario & Luigi: Dream Team as part of the Star Rocket Mad Skillathon as rare items, not appearing until just after the one hundred fiftieth small star. When collected, Mario and Luigi will speed up and be able to destroy spiked balloons for a limited time. Additionally, the Super Star appears as the icon of the Star Rank again. Also, the boss Dreamy Mario turns invincible during the chase scenes and flashes like he has a Super Star. Only one Super Star appears in Mario & Luigi: Paper Jam in the form of a Papercraft item. Before the fight with Papercraft King Boo, the trio upon Papercraft Yoshi can find a floating Super Star and by using its tongue, they can pull it in and use it. While under the effects of the Super Star, Papercraft Yoshi can defeat enemies instantly but it uses up more Toad power. The New Super Mario Bros. Wii version of the invincibility theme plays while in use. In addition, the Super Star is the icon of the Star Rank once more. Stars appear in Mario Golf: Advance Tour. It appeared only Star Courses by Dunes and Links. Odd Star Courses unlocked by game record condition and Even Star Courses unlocked by NGC connectivity with Mario Golf: Toadstool Tour record condition. A starred ball has no effect from landform. When Mario or Gold Mario gets a Birdie or better in this game, his post-hole animation involves him grabbing a Star and running while invincible and then striking a pose. Also, when he gets an Eagle in this game, he grabs a star, defeats a few enemies, and jumps. This item is also used as tee markers in the Mario's Star course. A clothing set, golf ball, and set of golf clubs are designed based on the item, and are available for Miis to use. Mario under the Star's effect in Mario Superstar Baseball. Stars only appear in Toy Field and Star Dash in Mario Superstar Baseball. A star can only be obtained by making the ball land on the slot and acquiring an item from the item slot. When a star is received, the star will take 30 coins from all other players and gives the player the 30 coins from each player. In Star Dash, the star may come out along with the coins that come out of the pipe-like mechanism. When the star is received, the player will receive 10 coins. When the player hits another player while the star is in effect, the player will steal 10 coins. The player can defeat Thwomps on the field also. The player must watch out for the Poison Mushrooms that come out. If the player touches a Poison Mushroom while invincible, the player will feel the Poison Mushroom effects and lose the star power up. Since the item slot was dismissed in the Toy Field of Mario Super Sluggers, it appears in a minigame called Graffiti Runner. In this game, the star is one of the many power-ups found inside treasure chest, in which the player must use the tackle button to open up. If the player acquires the star, they are invincible and impervious to almost all forms of attack, plus can be able to knock anyone else aside. However, the player is not fully invincible and will still get stunned by an earthquake caused by a larger player or a Chain Chomp. It also appeared in the Blooper Baserun minigame and shares the same thing. Though stars do not appear as an item obtained in Toy Field, it can be found when the player makes the ball land on the "Jackpot" space. In one of these jackpots, there is an event where the player must choose a treasure chest to find a star. If the player did, they will receive coins. Super Stars appear in the Nintendo DS version of Mario & Sonic at the Olympic Games, where they appear as an item on the Powerup Balls in the Dream Basketball event, under the name "Starman". If the player successfully throws a Powerup Ball with one on into a hoop, all of the balls that appear will be golden for a short while, and their icon on the top screen will change colors for the duration of the item's effect. They also appear in the Dream Canoe and Dream Long Jump events, where they grant the player temporary invincibility from all items, as well as increased speed in Dream Long Jump, indicated by character and their icon on the upper screen constantly changing color. In Dream Shooting, they are obtained by shooting an Item Box and are used automatically, giving the player unlimited shots for a short amount of time or until they move forward, and also cause their icon on the upper screen to constantly change color. Super Stars also make an appearance in Mario Sports Mix and in addition to making the character invincible, it has two theme songs. They also increase the speed and accuracy of the ball. In basketball and hockey, players cannot intercept the ball/puck when it is thrown. In volleyball, opposing players who touch the ball will be heavily immobilized for a while. In dodgeball, opposing players will immediately lose some health when hit, regardless of if the ball touches the ground or not. Stars are rare in this game. In some missions, an item restriction may limit the items to Stars, making it possible for both teams to get that item at the same time. In Mario Sports Superstars, Super Stars appear in the exact same golf post-hole animations from Mario Golf: World Tour, as well as Metal Mario's animations. A Super Star in Whammino Mountain, from Paper Mario: Sticker Star. Super Stars appear again in Paper Mario: Sticker Star, where they can be found in levels and grant Mario invincibility which lets him defeat enemies without battling them, much like Super Mario RPG: Legend of the Seven Stars. However, they are very rare, appearing only in Whammino Mountain, Rustle Burrow and Gauntlet Pond. In Paper Mario: Color Splash, Super Stars appear in Kiwano Temple, The Golden Coliseum, and Sacred Forest, and are used in the same way as in Paper Mario: Sticker Star. 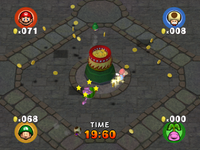 Super Stars appear in Mario Party: Island Tour as usable items in Perilous Palace Path, which, if one is used, doubles the total number of spaces the player gets to move with the Dice Block. Super Stars also appear in Mario Party 10 where they feature in the Cheep Cheep Leap minigame. In this minigame, the player has to use the Star to defeat as many Cheep Cheeps as they can in thirty seconds. In Puzzle & Dragons: Super Mario Bros. Edition Super Stars appear as the symbol for Light Orbs. They are also used as Skill Items. They raise the Skill levels of teammates whose Skill levels are under level 4 such as both forms of Peach, Bob-ombs, and all types/forms of Lakitus and Boos. Super Stars can be obtained by opening up ? Blocks; winning them from the Lucky ? Blocks game at Toad Houses; or from defeating Lakitus or Bob-ombs with a 10+ Combo attack. The Super Star balloon in LEGO City Undercover. A LEGO brick built Super Star in LEGO City Undercover. After being built, the invincibility theme from New Super Mario Bros. Wii will play. Super Stars are a frequent Item in the Japan-only Famicom Disk System game Yume Kōjō: Doki Doki Panic, which would later become the North American version of Super Mario Bros. 2. Super Stars are briefly referenced in Paper Mario: The Thousand-Year Door, in which a camera-wielding Lakitu near the Glitz Pit remarks, "Stars make you invincible?". In the Super Mario Mash-Up Pack in Minecraft, there is a painting of a Super Star. In the Wii U and Switch versions of LEGO City Undercover, the Pop Star character is unlocked by finding and building 5 Super Stars. A balloon shaped like a Super Star also appears in Festival Square. In Monopoly Gamer, the board contains four Super Star spaces. A player landing on one of these spaces may activate their "Super Star Ability" listed on their Character card. 10/85 This item makes you invulnerable to all attacks for a short period of time. The Starman bounces around and eventually tumbles out of the stage, but all you need to do is touch it to power up. It possessed similar powers in Super Mario Bros., except you could also harm enemies just by touching them while under its influence. NES Super Mario Bros. An erratically bouncing item that is hard to catch. If you can grab it, though, you'll be invulnerable to all attacks for a short time. In addition, no one will be able to grab or throw you, either. Make the effort to grab the Starman when it appears--watching your opponents turn and run from you makes it all worthwhile. SNES Super Mario World (08/1991) You may recognize these star-shaped items as they bounce across the stage. Picking one up will grant you a short period of invincibility. You can't wipe out enemies just by walking into them—like in Mario games—but you can still attack without fear. Your foes will be running scared! You'll see one of these little stars bouncing along the stage from time to time. Touch it to become invincible! (Well, for a while, at least.) Unfortunately , they don't work exactly the same way as they do in the Mario series, so you won't damage anyone just by walking into them - you'll still need to put some effort in. For this subject's image gallery, see Gallery:Super Star. In Paper Mario, running around a specific Candy Cane causes the invincibility theme to play in an old-fashioned jukebox style as it drops several Heart Points. In Super Mario World, the music for Star World is a slowed-down version of the Super Star theme. Super Stars and Power Stars only appear together in Super Smash Bros. for Nintendo 3DS / Wii U, due to the latter being part of Rosalina's Final Smash. ↑ Cain, Christine (July 7, 1999). Super Mario Bros. Deluxe: Prima's Official Strategy Guide, page 10. Retrieved April 10, 2015. ↑ Nintendo. (February 13, 2019). Super Mario Maker 2 – Announcement Trailer – Nintendo Switch. YouTube. Retrieved on February 14, 2019. This page was last edited on April 20, 2019, at 12:11.